If you're wondering how to travel with a dog, how to plan and enjoy the experience, then this is the place for you. Planning that vacation and wondering if traveling with your dog might be an option? There is good reason to travel with your dog. Bonding, friendship, fun, and seeing things from a dog’s perspective are the first things that come to mind. Knowing that you are with your dog means you also don’t have to worry about his well being while you are off enjoying yourself. If you decide that a vacation complete with your best fur friend is what you want to do, then it’s time to plan. A well planned out vacation eliminates any guess work and prepares you for any possible emergency that might arise. Where to go and how to get there are two big questions you must ask yourself before making the final decision whether or not to include your canine friend. If your plans include a road trip, then traveling with your dog will be much easier, but planning is still required. If you travel by plane and have a small dog, that can easily fit under the seat then, plane travel is a definite possibility. If you have a large dog, then the only air travel option to you is for your dog to travel in cargo. First step in this how to travel with a dog article is choosing your means of transportation. The easiest way to travel with dogs is by taking them with you on your road trip, either to a specific destination, camping, or simply sightseeing in many locales. It is much easier to travel with pets nowadays than it was years ago, because many hotels are boasting of their pet friendly services. Many outdoor restaurants and cafes will allow you to take the dog with you when you eat, and an amazing number of shops will welcome pets if well mannered, especially small ones. There are dog friendly beaches, outdoor festivals that allow dogs, and parks that permit your dogs. There will be places, however where you want to visit that do not welcome pets. This is where the planning comes in as you have a couple of options: do not frequent non-pet friendly places or keep your pet in your hotel room. Most vacationers save and wait patiently all year for that perfect trip, so the option of avoiding all places that don’t allow pets is just not an option. Car travel can be fun and relaxing with a dog if you consider the following prior to placing that key in the ignition. How well does your dog do on short car rides? Does he need medication just to get him from your home to the vets? If so, he might not be the best candidate for travel. Dogs that are used to car rides do much better as seasoned vacationers than those who really don’t enjoy the thrill of spin around the block. Get your dog acclimated to the car by taking many short excursions. Encourage him to stay in a crate or dog seat belt. Plan out the trip including where rest stops might be along the way and allow plenty of time for walks and rest (at least every couple of hours). Small dogs are usually welcome on many airlines and can ride in the cabin if they can comfortably fit under the seat. You will need a soft carrier and for convenience, I recommend one with wheels so you can push your pet around the terminal. You are often able to book your dog’s travel when you book your own. Most large airlines have accommodations for your dog, but Southwest, AirTran, JetBlue, Frontier, Virgin America do not accept pets at all. 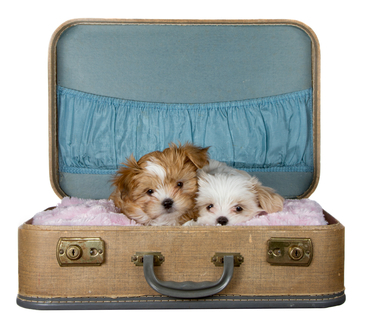 Each airline has specific requirements for pet travel. If the dog is too large to fit under the seat, he may be able to fly cargo. Airlines usually have restrictions concerning the number of pets that are allowed per crate and the total number of animals allowed overall on a flight. Most also have some age restrictions, but these are not unreasonable. For example most airlines won’t allow you to fly or check a puppy under the age of 8 weeks. Most airlines have specific guidelines on the size of crate, and the number of pets that can be accommodated on each flight. Most airlines will accept crates made of fiberglass, metal, rigid plastics, weld metal mesh, solid wood or plywood with a spring lock door and metal hardware. Most also require that a Live Animal Sticker be placed on the crate and a water dish be available and attached to the inside of the crate. Most airlines do not allow dogs to have toys or chews, but will allow you to line the crate with a blanket. Bracephalic dogs are usually required to travel in a crate one size large than would be expected for their height and weight. Some airlines such as American Airlines do not allow brachycephalic or snub nosed breeds to fly cargo, so if you have one of these breeds, your choices might be limited. Cargo holds are pressurized, and temperature controlled so it is not as traumatic as it might seem. It is not the best way to travel, though, so think seriously before you choose this option. Most airlines have restrictions on travel during extreme temperatures. Check with your airline to assure that you can check your pet especially if the outside temperature is either very hot or very cold. These temperature restrictions are in effect not only at your departure, but at any stop during the flight. Direct flights are the best way, but if you need to make connections, you will need to determine if the airline can accommodate your dog in cargo to your destination. Direct flights are also recommended because you must drop off your pet usually 2 hours before flight time. Pick up times depend on the location of the cargo office; some are in the terminal and others are separate facilities. The dog is not normally given food or water while in flight, so adjust your travel plans with this in mind. Some small commuter planes may not be able to do this because they do not have a pressurized cargo area. If your pet flies cargo, you must follow the rules spelled out by the airlines as to the size and type of crate and what can be attached to the outside of the crate. Most airlines do not allow any type of sedation when your dog flies. 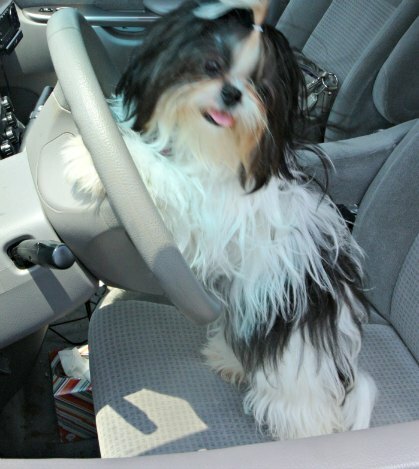 Most major car rental companies will allow your dog in the car at no extra charge. There would be a charge if there were damage to the car or for excessive shedding or cleaning. It is advisable for the dog to be crated while in the car to minimize clean up. Ask about their pet policy when you make reservations. Find pet friendly hotel accommodations where you will be staying and assure that you understand their pet policy. Many of these hotels cater to dogs, so you will meet many people along the way that are just as passionate about their dogs. Who knows, you might even meet some new friends. There are several hotel chains that are considered pet friendly, but you should check ahead of time as they are exceptions. Bed and Breakfast Accommodations more your style? These are harder to find but not impossible. Ask about pet policies when you find your perfect B & B. Many require an additional pet fee and limit the number of pets you may have in the room. By and far, camping and RV-ing are two of the easiest ways to include your dog on your next trip. Most state parks allow dogs but its always best to check ahead before making plans. National parks allow dogs in campground areas but not on trails. Private campgrounds vary. Some are very accommodating and allow dogs everywhere, where there are some that only permit dogs in certain restricted areas. If you do decide to rough if with your dog, consider a few extra items for your dog's backpack of which the contents is listed below. Add some first aid supplies and tweezers for removing ticks. Bring tick and flea repellent, antibiotic ointment, hydrogen peroxide to clean wounds, small scissors to clipping away hair, a clean bandana to act as a bandage, or if you prefer vet wrap that clings to itself, Benedryl if your dog gets stung or into something irritating. The dosage for Benedryl is 1 mg per pound of body weight. So a 10 pound Shih Tzu can have just slightly less than 1/2 tablet of a 25 mg pill. Plan for emergencies. Dogs get sick, dogs don’t always act the way you would expect them to in unfamiliar surroundings. Pack a small first aid kit, some probiotics, and some anti-diarrhea/anti-vomiting medications just in case. Ask your vet for recommendations. If you are going to one destination, consider looking up the websites of nearby veterinary hospitals in the event your dog gets sick. This won’t be practical if your plans include stop overs in many locations. Assure safety by taking your dog’s vaccination records, rabies tag and identification tags securely attached to a collar, and consider a microchip as an added precaution. If your dog is not crate trained, begin now. Most hotels require that the dog remain in a crate when you are not present in the room. Your dog may not need a full wardrobe of expensive clothes, but he will need his own bag packed with the essentials. Here are my recommendations. Dog’s paperwork including shot records, health certificate, rabies certificate, and name/address/phone number of your vet and a vet at your destination. Once at a hotel, find out where the dog walking area, as well as which areas of the hotel are off limits to pets. Keep your dog on a leash at all times when out and about. Do not keep your dog alone in the hotel room unless crated. Check each hotel room for specific requires. Some will allow you to keep your dog alone in the room for 30 minutes at a time. Respect the rules. Make sure your dog relieves himself before entering any business establishment or outdoor festival. If your dog has a tendency to bark when you are gone, do not leave him alone. Consider carrying your small dog in crowded areas, as people don’t always look down when they hurry by; Safer for the dog and the people. Don’t feed your dog immediately before beginning a trip. Save the big meal until evening when you stop. Offer small snacks throughout the day.